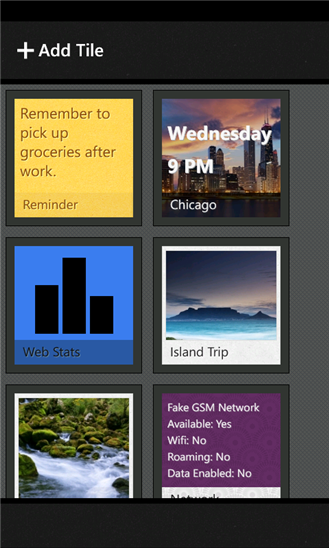 Quick Tiles allows the creation of live tiles that you can pin to your home screen. Choose from multiple default backgrounds or use your own photos. Quick Tiles allows the creation of live tiles that you can pin to your home screen. Choose from multiple default backgrounds or use your own photos. Tiles are fully customizable and support adding custom text, background colors, images, and photo frames. Note and Photo tiles that can be used as a reminder, or to just pin a picture to the home screen. Countdown tiles that will count down the hours to a selected date. City Clock tiles that show the time in a selected city. Connections tiles that show useful information about your phone's connection settings. Memory tiles that show information on your phone's memory usage. More types of tiles to come in future updates. The trial mode has advertisements and can only pin one tile to the home screen. Full version removes ads and allows multiple pinned tiles. Moon phase tile that shows the current phase of the moon and Command tile that allows shortcuts from live tiles. Vintage, Sepia, and Grayscale image filters to Note tiles. Update 1.2 includes loading speed improvements and two new picture frames. Appointment tile that shows your next two upcoming appointments. Background Effects that let you add some textures to backgrounds in any color. Preset themes for quicker styling. There are currently eight themes, Photo, Photo Frame, Theme, Sticky Note, Metal, Wood, Newspaper, and Dark. New icons that can be set for Command Tiles.